The Hwasong-15 intercontinental ballistic missile is shown Wednesday at an undisclosed location in North Korea. SEOUL, South Korea -- Two days after North Korea test-launched its most powerful missile to date, a clearer picture is emerging of Pyongyang's technological achievement and what still remains before it can legitimately threaten the continental United States. Many questions remain, but there's broad agreement from government and outside analyses the huge Hwasong-15 intercontinental ballistic missile represents a significant step forward, putting the North close to its goal of a viable arsenal of nuclear-tipped long-range missiles -- maybe as early as mid-2018. The two-stage liquid-fuel missile fired Wednesday is potentially capable of striking targets as far as 8,100 miles, which would put Washington within reach, South Korea's Defense Ministry said Friday in a report to lawmakers. It's also considerably larger than North Korea's previous ICBM, the Hwasong-14, and designed to deliver larger warheads, the ministry said. That would seem to confirm the North's boast after the launch the Hwasong-15 can carry "super-large heavy nuclear warheads." Michael Elleman, an analyst at the International Institute for Strategic Studies, said it appears the Hwasong-15 can deliver a 2,200 pound payload to any point on the U.S. mainland. 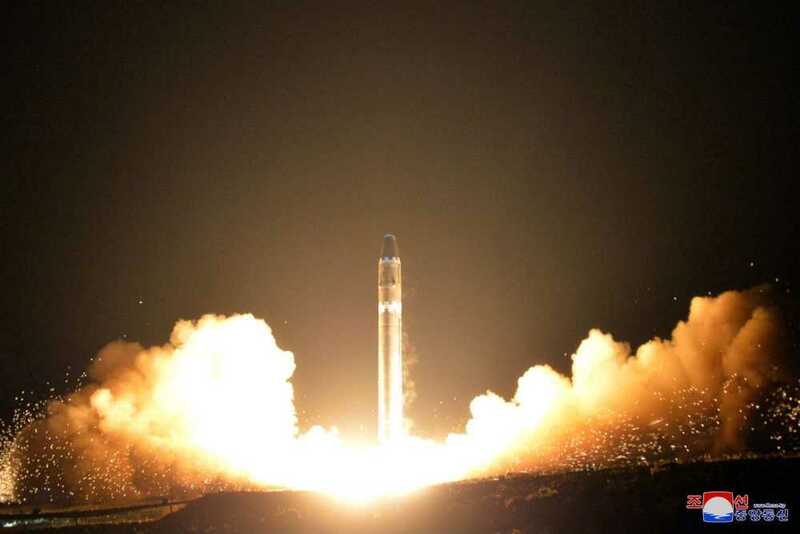 North Korea, which has so far conducted six nuclear tests, almost certainly has developed a nuclear warhead that weighs less than 1,500 pounds, if not one considerably lighter, Elleman wrote Friday on the 38 North website. North Korea said the missile Wednesday reached an apogee of 2,780 miles and flew 600 miles, splashing down near Japan after being launched from a site near Pyongyang on a high trajectory to avoid other countries; that flight data was similar to what was announced by South Korea's military. It's still not clear how close the missile is to being combat-ready. The Defense Ministry told lawmakers further review is needed to determine whether the missile's warhead can survive atmospheric re-entry, accurately hit a target and detonate properly. South Korean President Moon Jae-in shared his country's assessment with President Donald Trump in a telephone conversation Thursday night. The leaders reaffirmed their commitment to strengthen pressure and sanctions on Pyongyang to discourage its nuclear ambitions. Eugene Lee, spokeswoman of South Korea's Unification Ministry, said the Seoul government thinks the North hasn't crossed the "red line" in weapons development yet because it hasn't perfected its ICBMs. Hwasong-15's 9-axle transport vehicle, which the North also revealed for the first time, was also 2 meters (6.56 feet) longer than the 8-axle truck the North used to carry the Hwasong-14s. The Hwasong-15's first stage is powered by a pair of engines that were also used in the single-engine first stages of the Hwasong-14, the ministry said. It was still working to analyze the construction of the second stage. It's possible that the missile has been designed to carry simple decoys, or other countermeasures, to confuse the U.S. missile defense system, Elleman wrote. He added that "if low confidence in the missile's reliability is acceptable, two or three test firings over the next four to six months may be all that is required before Kim Jong Un declares the Hwasong-15 combat ready."